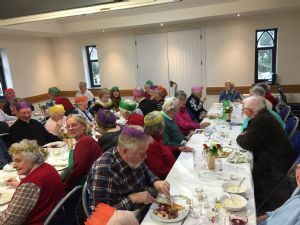 The Friendship Lunch is our monthly "lunch club" for people who would normally eat Sunday lunch alone or not at all. A modest charge to cover expenses is made and the whole operation undertaken by church members on a voluntary basis. The increasing popularity of this was one of the reasons for the rebuilding of the Jubilee Vestry. Our next lunch is on the 7th April due to the Easter Festival and will start at 1pm. We have a full list of subscribers at the moment, so it is vital that you confirm your place each month and attend when you book. Please contact Lorna Sykes on 01628 486874. Please note that the May lunch is on 12th May at the usual time of 12.45pm.